I have missed the asp.net Web Site Administration Tool that used to be included with Visual Studio. I created an alternative for asp.net mvc 4 you can find here. For asp.net mvc 5, I created an Azure Site Extension to provide the same functionality. It can be run from VS on your local machine as well as installed as a site extension on Azure. I recently developed a website to replace the built in ASP.NET Configuration Website Administration Tool provided by Microsoft and Visual Studio. This tool has the ability to add new users to a ASP.NET MVC 4 website in bulk. For example, if you have a list of usernames and passwords that you want to set up new accounts for, you can use the "Bulk Add New Users" functionality. Users can also be added to Roles via this page. Multiple Roles are separated by spaces. The built in ASP.NET Configuration Website Administration Tool provided by Microsoft and Visual Studio left something to be desired. I have developed an alternative that can be used with ASP.NET MVC 4 SimpleMembershipProvider. Text below in bold is dynamic and represents the UserName and RoleName property passed into the AddUserToRole() method (or the UserId,RoleId associated with the UserName,RoleName). Text below in bold is dynamic and represents the RoleName property passed into the CreateRole() method (or the RoleId associated with the RoleName). Text below in bold is dynamic and represents the UserName and Password properties passed to the CreateUserAndAccount() method as well as the UserId generated as part of user creation. Similarly, the name of the UserId and UserName columns, and the name of the UserProfile table may also be different based on your specific configuration. The UserName below (in bold) is dynamic, it represents the UserName parameter passed to the Login() method. 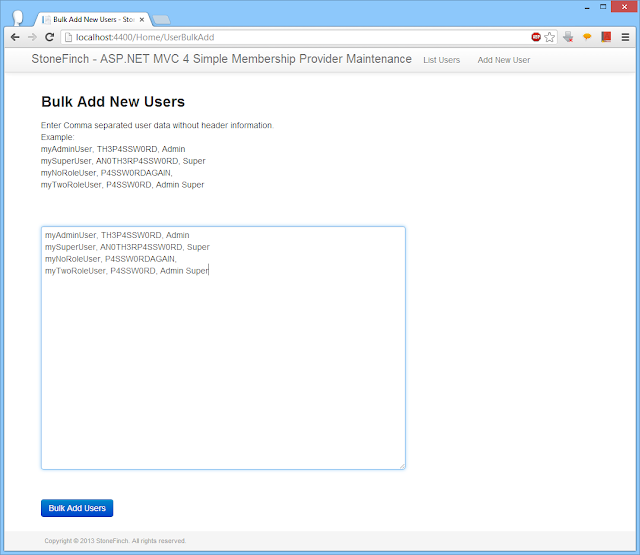 There is a new Membership Provider in ASP.NET MVC 4 that can be used for Membership, Users, Passwords, Roles, Profile, Authentication and Authorization! It is called the Simple Membership Provider. It uses the WebMatrix WebData WebSecurity class as a facade.